Ocala/Marion County Florida earned that title due to the fact that they have the largest number of horses and ponies than any other county in the United States; more than 35,000 Thoroughbreds alone! So Barb scoured the internet looking for the perfect horse related event that we could go to while in the area. She found it in the Grandview Invitational; a draft horse hitch show where horses weighing up to 2,000 pounds are judged pulling wagons. So along with Dan and Jeanie we headed over to Ocala for the event! Each team is judged on their physical condition, conformation and movement as a team; ideally with each step in unison with the other horses on the team. Belgians, Percherons and Clydesdales each compete in 3, 4 and 8 horse classes. Barb and I have been to a lot of horse shows in our days and this one ranked right near the top for talent and beauty. The nightmare that is our stay at this park continues with constant loud parties late into the night. We are not opposed to any of these things but this place takes it to a new level! Parents....don't bring your kids here unless you want them to learn new words as every other word spoken around the campfire is the F-Bomb. We were wondering why the owner and manager were not doing anything about the late night parties until last night when a class C with a toad came the wrong way down our dead end lane last night about 10:00pm and stopped about 10' from our bedroom window. Both the owner and manager came up to the newly arrivals tripping over themselves and in slurred speech introduced themselves and tried explain to them where they needed to park. In fact the first words out of the managers mouth were "Excuse my beer and cigarette"...…. Our time here cannot end quick enough! Despite all this we are not letting it stop us from getting out and enjoying our time here. We have taken many a walk with the dogs. 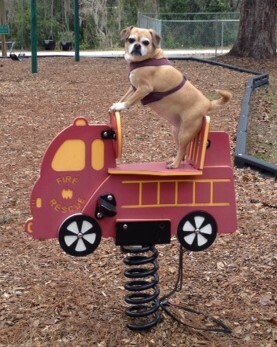 Daisy's favorite walk is to the park down the road where she gets to play on the equipment. We have also been out fishing a few more times both alone and with Dan and Jeanie but the cooler weather has really shut them down. We also got together a couple more times with Mike and Liz. The beautiful thing about hanging out with locals is that you get to find out all the great bars and restaurants. Together we have hit The Loft, Kelly's Half Shell (get the fish and chips!) and Burkes of Ireland. We were joined by Mike's brother John and his wife who own several shrimp boats in the area. All four are great people and it was interesting hearing the ins and outs of the commercial shrimp fishery. Saturday was a momentous occasion as we finally met a couple that we have been trying to meet up with for a couple of years. We almost met last year in Arizona but an illness prevented that meeting but 360+ days and 1,940 miles away we finally did meet fellow bloggers and fulltime RV legends Steve and Mona Liza. Steve and Mona Liza were on their way north from Naples and were staying in the Crystal River area for a couple of days. We met at The Freezer, and over some great food and a couple of beers, compared stories and got to know each other better. It was a long time coming but worth the wait. From there we all headed over to Shelly's Seafood Market that came highly recommended as one of the best places to get fresh seafood in the area. We treated ourselves to a nice Yellowfin Tuna steak while Mona Liza and Steve got a variety of tuna, grouper and tilapia. Fresh seafood acquired it was time to say our goodbyes and head in separate directions. We hope to meet up with them sometime in the future and share a hiking trail or perhaps enjoy a beverage at a brewery! With less than a week left here in the area we have something planned almost everyday including a visit from Farmer Bob and DeAnne from the frozen tundra of North Dakota!!!!! That is great that you were able to meet up with MonaLiza and Steve! Great people, for sure. :) The neighbors sound fun. Who knows...maybe you’ll get invited to their Super Bowl party! That is so cool that you met up with Steve and Mona Liza. I love that team of Black horses. They are beautiful. I hope your month ends without a major incident. The minor ones seem bad enough. Percherons are one of the most beautiful horses you will find and these were in such unison it was incredible! Bet you are missing the Cold Weather back home about now. Daisy looked like she was having fun. The Manager needs lessons in Public Relations. Thought you might want to check this out if you are heading back further south. You met Lorne and Sue at the Blogger-Fest two years ago. Might be more to your liking. We'll be checking it out next year. Very interesting post, I have been following their adventures for quite a while. We are planning on staying in a similar area when we leave here in a week! Sorry your time there has been so unpleasant however it seems you are making the best of the situation and getting out most days. I loved the horses, such graceful animals! Thanks for sharing. Less than a week left, we learned a valuable lesson on this one! Glad you are making the best of your less than desirable park and chillier than normal weather. The horses are beautiful. So glad you finally met Steve and MonaLiza. They are wonderful people and such fun. Beautiful horses. I wonder what it takes to get them in step like that. I think the Budweiser Clydesdales will be at the state fair so bring your autograph book. Daisy looks like she is having fun. Those are always fun to see, hopefully they will be there when we get there! 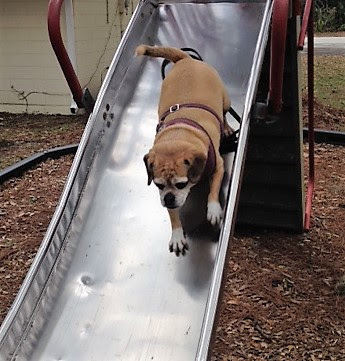 Daisy love posing for photos although I don't think the slide was her favorite! Those horses are so cool! How the heck would you train them to be in step with one another? I don’t think we could last as long as you guys in that campground. You had us in stitches with Daisy in the playground...what won’t she do for you! She’s such a good sport. What makes it bearable is the fact that our friends are in the area. That and the fact that we are usually only here at night. We used to visit Ocala, Dave's parents lived there, saw lots of horse farms but never got check out any shows. We know too well about drunk managers, one of the reasons we left Durango. Glad you finally met Steve and Mona Liza, we always look forward to seeing them. Sounds like you've had fun with the Quigleys. Loved the photos of Daisy. The horse farms in that area are incredible! We are seeing Mike and Liz again tomorrow for dinner at their house! Isn’t fun to finally meet fellow bloggers in person??!!! What fun.....the horse show looked beautiful. We had been following each others blogs for year's, it was awesome to finally meet them! Love the horse show! If you are heading further south, you might check out Herrmanns Royal Lippizanner Stallions in Myakka City - beautiful white horses! Those would be cool to see! If has been years since we have seen them. What a great horse event. I would have loved to see it. Too bad your campsite is such a pain. Where are you off to after you leave there? 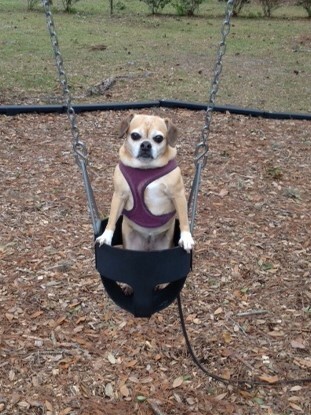 The pics of Daisy at the playground are hilarious! Those horses are huge and in great shape. We had 2 Clydes when I was a kid on our farm. My sister has a pic of all 6 of us on one of them. Gentle giants. That Rv Park sounds like a nightmare, we left the one we didn't enjoy in north Phoenix a week early. It was worth it. Daisy is a good sport tolerating pretty much anything we do to her! The Clydesdales are massive animals, the size of their hooves alone are incredible. What a great time! We had a Percheron ranch near us back home. They were always in the town parades. Gorgeous horses! Looks like you picked a winner of an event. That Daisy is always havin' a ball! The Percherons we probably the most beautiful horses there, sleek, black and shiny. The owners must put hours and hours of grooming into each animal. We are looking forward to meeting you guys as well in less than 5 days! Aww you are so kind Jim and Barb for saying the nicest things. We are so happy to have met you finally! Barb seemed to know where the happenings are, just to get away from your campground! Steve was really impressed and interested in the progress of your house building this spring. It was great meeting you guys! We will be posting our progress as we go and of course you are always welcome to come by and see things first hand! Heavy horse hitches are amazing. You were lucky to hit such a great one. Those eight horse hitches are incredible. How do they do it?! Sorry to hear the campground situation hasn't improved. Good excuse to get out and do stuff for sure. Amazing isn't it? They did have a couple of situations when the horses got tangled up in the rigging. All the horses have to work together or there is trouble!